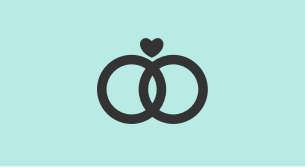 Once you've agreed your venue, and made your booking, your first official step on the path to marriage is giving notice at your local registrar office. By law both of you must attend this appointment in person. You can give notice up to 12 months before your ceremony date, but please bear in mind there must be at least 28 days between giving notice and the ceremony taking place. For individuals subject to immigration control, the waiting period may be extended to 70 days by The Home Office. We recommend that you give notice at least three months before your ceremony. You must give notice in the local authority district where you live and have lived there for seven clear days. If you live in different registration districts you should give notice separately. You don't have to do this on the same day as each other. Please note that you can't give notice of your marriage without your venue being booked beforehand. The statutory fee for giving notice of marriage is £35 per person, or £47 per person if one or both of you are subject to immigration control. The is payable on the day the notice is given and we only accept card payments. We offer appointments to give notice Monday to Friday, from 9am to 3.30pm. The Register Office is closed on the first Wednesday of each month until 1pm. proof of your name, age and nationality. All documents provided must be originals and not photocopies and need to be current. certificate of naturalisation - this needs to be provided if you have become a British citizen. full valid UK driver’s licence. If you live together, your council tax statement can only be used as proof of residence for one individual. the death certificate of your former partner. A foreign divorce will usually be recognised in England and Wales if it was valid in the country it took place. Original documents are required, along with a certified English translation. The documents may need to be referred to the General Register Office (GRO) for approval. Your ceremony will not be able to take place unless these this has been approved by the GRO. For any couples who are subject to immigration controls, it is a legal requirement for each individual to provide a passport style photograph. be recently taken to reflect your current likeness. Photos that have been cut down from larger pictures will not be accepted. If either of you are under 18 years old, we'll need your parents' or guardian’s consent to the marriage. If your parents are divorced we may need to see court orders. The Superintendent Registrar can advise you.